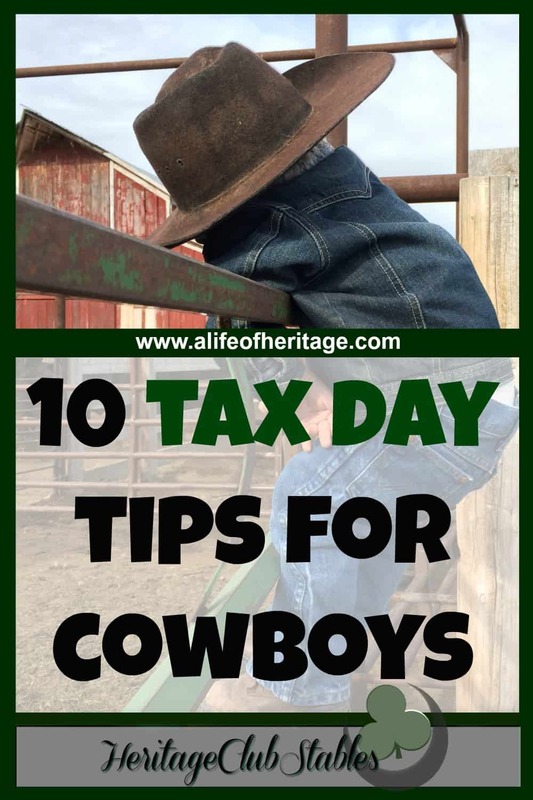 "Tax Day Tips": 10 tips for cowboys! 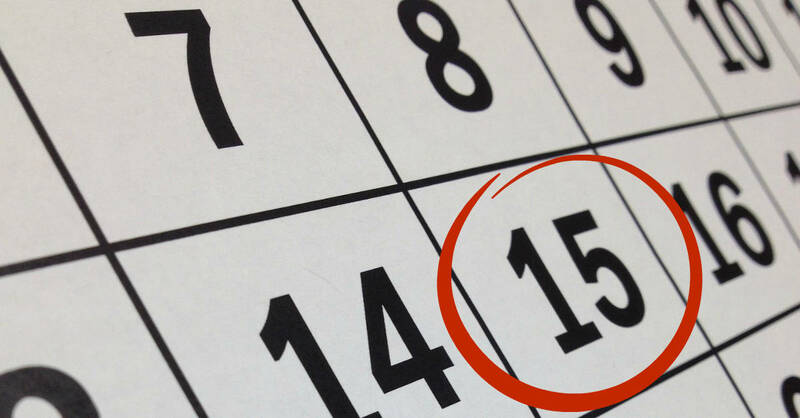 April 15th is always just around the corner and we have not always followed these tax day tips. Tax day is a day to be dreaded, at least in our family! Every year we pull out “the box” with all the receipts. We go look through the pickup and “the drawer” where receipts were thrown into and forgotten about. If there ever is to be a war in our household, it will be the day the receipts come out. It can be stressful, confusing and down right discouraging. Are we the only ones who have experienced this? A couple of years ago we whipped and spurred and made more than we ever had, which compared to normal American standards really wasn’t that much. The year came to a close and unforeseen changes happened that we didn’t expect and our paycheck was cut in half. We almost regretted making as much as we did the year before when our taxes were filed away and we received notice that we owed what would be almost 2 months worth of wages. When I got the call telling us what we owed, my heart skipped a beat, dropped to my toes, and I think I had a slight numbing sensation that hit the ends of my limbs. When I finished the conversation I was in tears. As I hung up, I melted down into the carpet and cried. How in the world were we going to pay that? It was a setback that was hard to come out of. We were set back months, and working our very hardest to make what we could, but it would’ve still taken four months of wages plopped into our laps to get back on track. There has got to be a better way, right? When almost 35% of the money we earn goes to taxes in one way or another, we all need to do everything we can to help our money work more to our advantage. Why is this important? 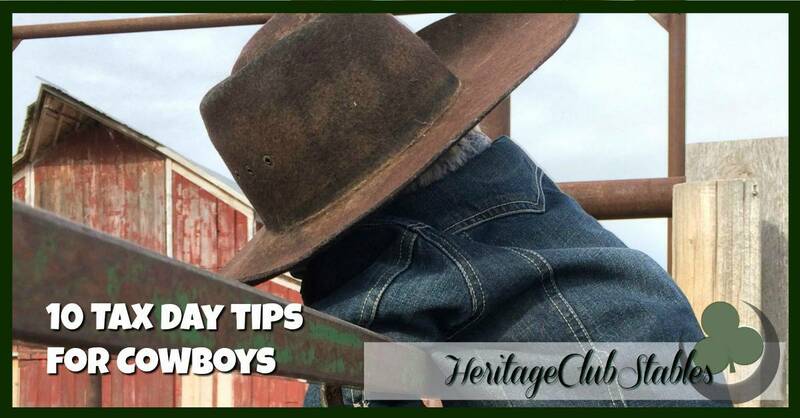 Because if you are making money solely from day working, training horses,or shoeing horses (or all of the above! ), you are considered self-employed. Pay Taxes Quarterly Schedule a time with your accountant to pay your taxes quarterly. Hundreds of dollars at a time is much easier to swallow than a lump sum of thousands. You will pay 100% of your Social Security and Medicare taxes, as opposed to when you are working for an employer, and they pay half of those taxes. Keep Receipts for Deductions You will benefit from keeping track of all those receipts of the items purchased that are related to your profession(s). These will be your “deductions” that will help you in the end not pay as much in taxes. Find that one box or folder where you will keep all your receipts together. Make it a habit everyday to clear out the pickup, your wallet and back pocket and put the receipts in one place. Document Clearly on Receipts Document clearly on your receipts and deposit slips what the items of purchase were for, and what the income was from. It is so hard to remember a year later what was purchased or what each income item was from. These may seem like ‘duh’ suggestions but sometimes we just need a few reminders now and again, encouragement to keep at it. Once a month discipline If you don’t already keep clear and accurate records, an easy way to document and print out monthly deposits and withdrawals is to log into your banking account, select it to show only the deposits and copy all the deposits for each month and paste it into a Word or Excel document. In your document you can type out what each deposit paycheck was from. Then do the same for the withdrawals. Delete all the unnecessary words and numbers and type in what the expense was for. When you go through the deposits and withdrawals, double-check you have the receipts accounted for and put them in your file or box. Do this at the end of each month and print it out. Keep the paperwork with your receipts and when it’s time to work on taxes you won’t have any questions about what this or that was for. Remember: this is a discipline. It may be hard to sit down once a month to work on taxes but it sure is easier than sitting down to do it once a year and having no idea where to even begin. Don’t buy equipment or items you don’t need and won’t use just to not pay taxes. You are better off putting 65% in your pocket, than having equipment sitting around that you won’t use, depreciating. Remember that anything you trade for can’t be used as a tax deduction if it’s a loss. An example: we had a horse ready to sell. I was about to upload the final video so we could start advertising her and then she died unexpectedly. We lost several thousand dollars because of the loss of the sale but we couldn’t use that as a loss on our taxes because we had traded a month of riding for her. If you ever are a “broker” of sorts and help someone sell their horse or animal, and the check was written to you, you will need to send the owner of the horse a 1099, because all the income wasn’t really paid to you and you won’t declare the entirety of the check paid to you on your taxes. Be as thorough as possible to make sure you are keeping track of and deducting all expenses related to your business. This is what will make the difference in the final number you will pay. Hire a CPA. They have paid their dues in schooling and now are paid the big bucks to work with people’s taxes. And they must like it, so let the people who like to think about and work on taxes help you out when your brain is melting from the sheer terror of T-Day. “Adulting” is the new word making its way around the internet now. Adulting is hard, but growing up must happen. Don’t let taxes be the ruination of you or your family or marriage. Do what you can to make it as easy as possible and work with your spouse in a loving manner. Help and support each other. Get it done, then go back out, step on that horse and make some more money. No excuses. Prepare for T-Day, today. Really, it will be worth it. If you are on a horse owner, you may be interested in our free resource page for horse owners. It is password protected and updated weekly. So take a moment and sign up below. You will receive an email shortly and will be able to download and print all the helpful resources.